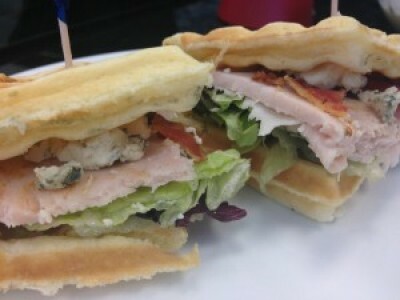 This is a great recipe for a waffle turkey club sandwich! Grill the bacon until crisp and golden. Make your waffles, when cooked spread one side of each piece of toast lightly with mayonnaise. Top with 4 slices of turkey and 3 slices of bacon. Add salad and crumbled stilton then top with waffle.